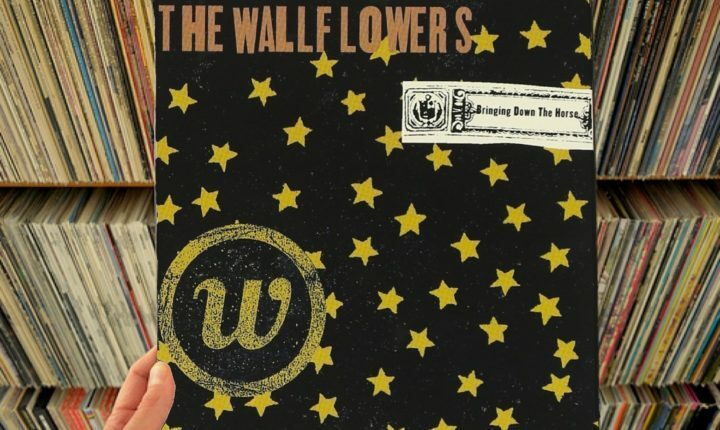 A deeper look at the grooves pressed into the Twentieth Anniversary 2LP reissue of Bringing Down The Horse by The Wallflowers. The trick that The Wallflowers found on their sophomore album (which had sort of evaded them when their self-titled debut album hit in ’92) was not exactly to blaze a brand new trail exactly, but to balance the tones that Wallflowers singer Jakob Dylan’s father Bob had utilized when he’d first gone electric in 1965 (the brash stuff which had come with Bringing It All Back Home, Highway 61 Revisited and Blonde On Blonde) with a distinct attachment to the emotionally articulated sounds which had come along with alt-rock in the Nineties. In effect, what some listeners heard wasn’t “old” while others definitely heard a thread of “classicism” it split the difference and got an enormous group of people to appreciate one band in spite of themselves. It was a pretty brilliant approach, and remains an absolutely beautiful love letter for the time. All of the keystone elements which would make a multi-platinum release of Bringing Down The Horse as well as making it an enduring (if often underrated), classic album are right up front and center as soon as the needle drops and sinks into “One Headlight,” which opens the album. There, Jakob Dylan mimics his father’s style of lyricism so closely that it’s still hard to believe Bob Dylan didn’t write lines like, “So long ago, I don’t remember when/ That’s when they say I lost my only friend/ Well they said she died easy of a broken heart disease/ As I listened through the cemetery trees” and, “I seen the sun comin’ up at the funeral at dawn/ The long broken arm of human law/ Now it always seemed such a waste, she always had a pretty face/ So I wondered how she hung around this place” – they’re just so damned close to the ‘Bob Dylan as heartbroken soul-ster’ that fans of the singer know so well as to make many wonder. Even as they’re wondering though, those who need The Wallflowers to not seem quite so close to ‘Bob Dylan classicism’ can immerse themselves in the duskier and more fluid composition supplied by guitarist Michael Ward, keyboardist Rami Jaffee, bassist Greg Richling and drummer Mario Calire, which owes much to Dylan the elder, even if it does not perfectly mimic his music. With a general template set by “One Headlight,” The Wallflowers polish one gold nugget after another as they burn through the set of singles which comprise the A-side of the album. “6th Avenue Heartache” again places a scratched and dusty mirror before a few Bob Dylan songs which is clear from the title on down, but the dual vocal performance applied by Jakob Dylan and Counting Crows singer Adam Duritz wring every last possible drop of catharsis in the song into the ears of listeners before putting a decidedly ‘Nineties’ spin on Dylan-esque poetry for “Bleeders” (check out lines like “I guess I should be ashamed/ But I forget to be vain/ Well I did the best I could I guess/ But everything just bleeds/ They say you’re only sad and lonely/ And no one is impressed”) to close the A-side of the album. While some listeners may balk at the fact that each of the four sides of this pressing bring with them the necessity for regular changing/flipping in order to keep the record’s momentum moving (at most, one side of either of these two plates holds three songs – and the D-side holds two), the argument for the fact that all sides seem lean is that, unlike so many other vinyl reissues, there’s far less likelihood of skips from the moment of unboxing because they aren’t pressed so close together. It might seem like a reach for a good reason but, given the multitude of albums which suffer from that problem because they were pressed on CD first and stacked with tracks because of it, there is most definitely something to be said for it on this reissue. Now, looking deeply into “The Difference” with the benefit of a slightly more critical eye, it becomes easy to see that, in fact, it is the first big breakthrough for Jakob Dylan as a songwriter standing on his own merits instead of angling toward something akin to his father’s work. Other than being the hardest-rocking song on the album, the lyric sheet features more concrete imagery in it than it does less-tactile, poetic angles. Here, listeners can really see the two boys by the river telling stories and lies to each other while catching fireflies in the dark rather than only getting an artful sense of it as they might have if the idea had appeared in “One Headlight” or “6th Avenue Heartache.” Likewise, while there’s clearly a lot more license taken with lines like “They say that children now they come in all ages/ And maybe sometimes old men die with little boy faces,” they still sit as more solid in the minds of listeners to mull them over as they also contemplate how little anything ever changes in and about those they know who really need to (in extension of the title lyric). They’ll find they’re still chewing on that after “Invisible City” has played through (those who really want to get an idea of that song will need to lift the needle and restart it because, while it’s not a bad track, it doesn’t hold a candle to “The Difference”) and the needle needs lifting again if they wish to continue along. While there’s no denying that the second plate in this Bringing Down The Horse set is lighter than LP1 (three songs on one side, two on the other – and not a single among them), that doesn’t mean its worth skipping. In fact, both “Josephine” and “God Don’t Make Lonely Girls” standout as being landmark deep cuts which both bemoan loss and loneliness, but (in a similar manner to the singles) treat the poetic sense of malaise and loneliness which powers them both like something of a celebration. True, they move slower than the singles of LP1, but they feature examples of great lonesome poetry and conjure the image of Jakob Dylan as a lonely man in a bar looking up to catch these images and scribble them down quickly – but also make sure that no one saw him do it. Weighing this 2LP set as a whole, that Bringing Down The Horse has been reissued now at its twentieth anniversary is far less confusing than the fact that this is the FIRST time it has been reissued in twenty years. Listening here, even passive fans who really lost track of The Wallflowers after the memory of this album faded can easily and will be taken back to the brightness of this moment in the band’s career. Granted, they’ve never come close again since – but that doesn’t mean it isn’t worth re-living; it is spectacular and deserves recollection. The Bringing Down The Horse 2LP Twentieth Anniversary reissue is out now. Buy it here on Amazon.